A Ming dynasty block print portrait o Cao Cao frae Sancai Tuhui. This is a Cheenese name; the faimlie name is Cao. 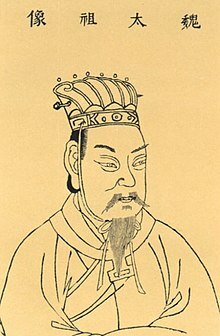 Cao Cao (IPA: [tsʰɑ̌ʊ tsʰɑ́ʊ]; 155 – 15 Mairch 220), courtesy name Mengde, wis a warlord an the penultimate Chancellor o the Eastren Han dynasty who rose tae great pouer in the final years o the dynasty.